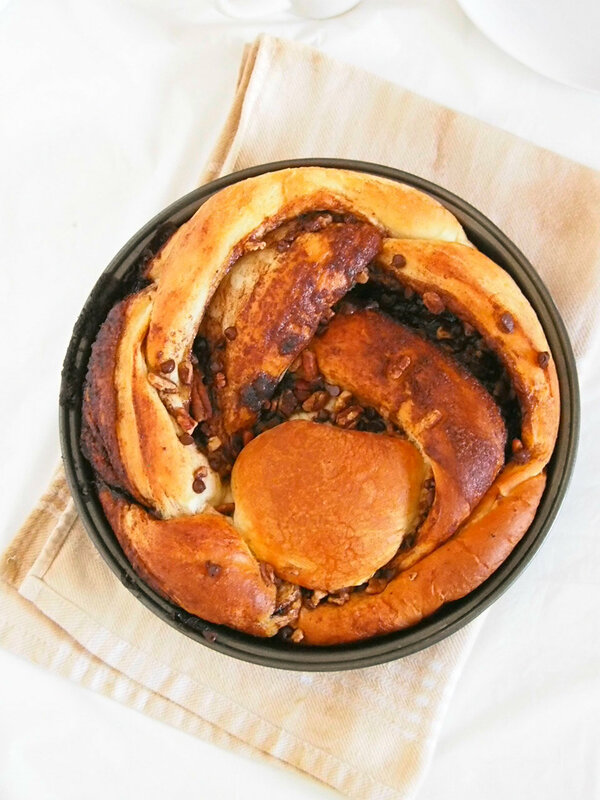 This Chocolate Pecan Cinnamon Bread is a soft, tasty bread braided with a delightful mixture of cinnamon sugar, cocoa, chocolate chips and pecan nuts. The addictive flavor and the soft texture of bread will have you pulling out a piece of this bread one after another. I might be weird. While it is scorching outside on a hot summer day, I make the oven add heat to the house by baking bread. Yep, summer does come here in Winnipeg, and while we are known for frigid, bone- shivering winter, our summer days can get pretty hot too. But I don’t mind the heat when I want to make bread. I know, it is hot and the last thing people want to is be near a thing that produces even more heat in addition to the hot weather. 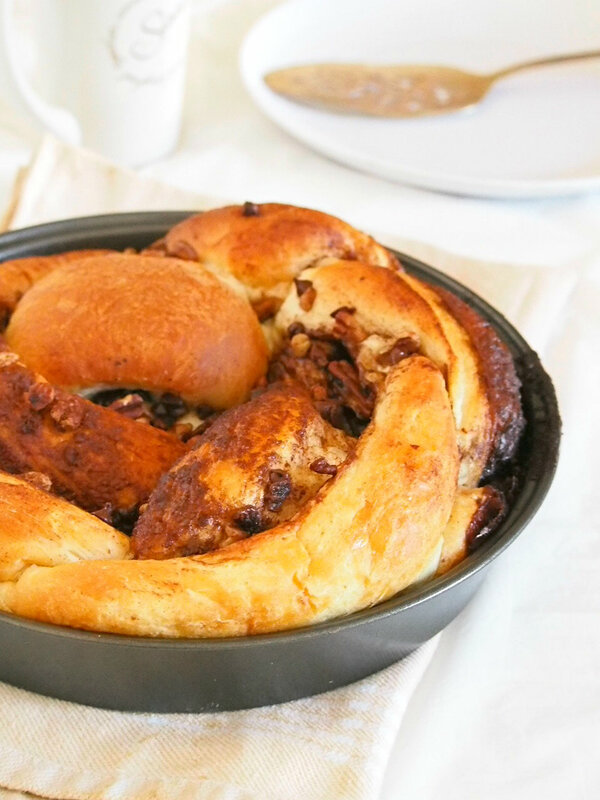 But come on, look at this Chocolate pecan cinnamon bread. You will understand why. 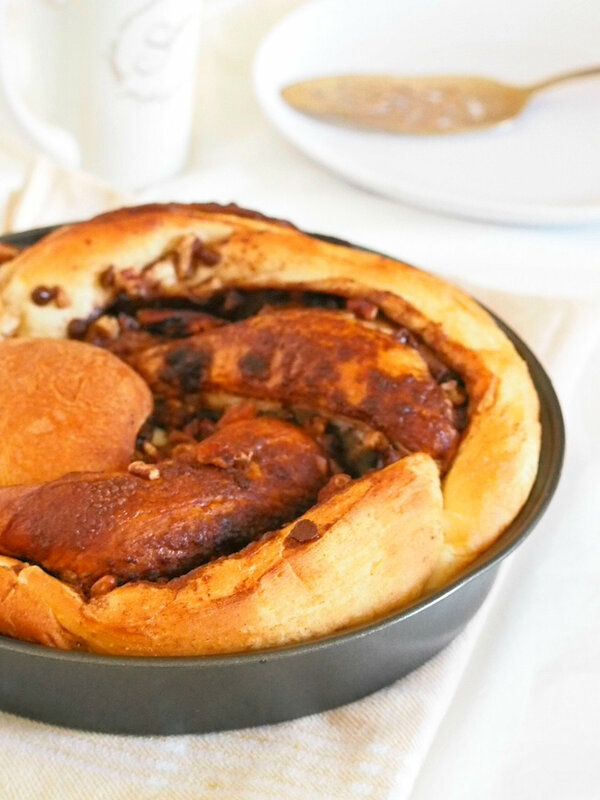 It is a very soft bread that you can actually eat on its own, but here it gets elevated by the addition of cinnamon sugar, chocolate chips, cocoa and pecan nuts. 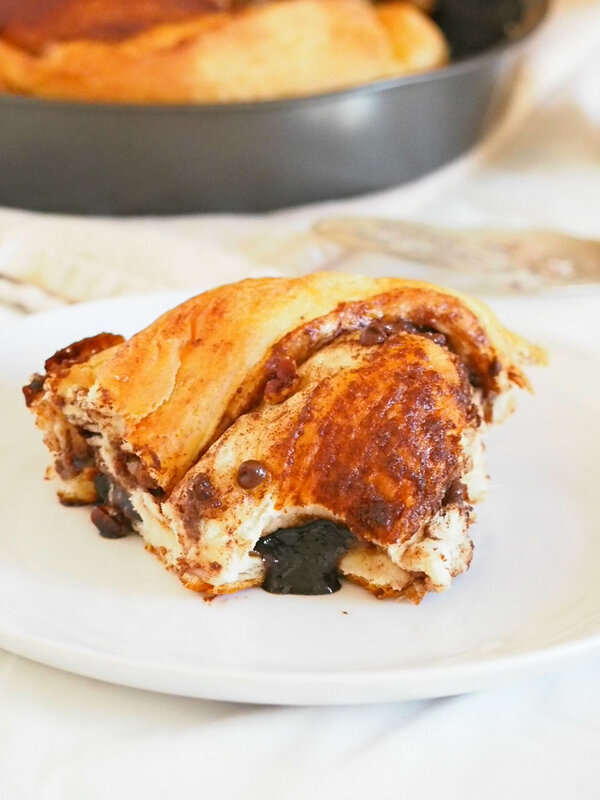 Now why would I even mind a couple of hours of the heat when the reward is something as soft, and as chocolaty as this cinnamon bread? The dough recipe is adapted from my current bread favorite, the Austrian Buchteln. I can’t even begin to tell you how amazed I am by this bread that comes out really soft as a result of a process that does not require any actual kneading of the dough. The most physically demanding task it will require you to do is to stir a sticky dough inside a bowl using a wooden spoon for about seven minutes (if you will call that physically demanding at all). 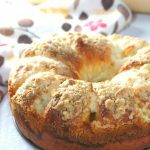 I love the slight crunch of pecan against the soft bread, and the delightful flavor of the filling makes this bread so amazing, even on a hot summer day. 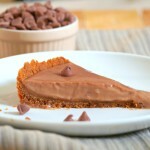 Although, I can also imagine myself having this with a mug of hot chocolate on a cold , winter morning. That’s such a nice foresight! 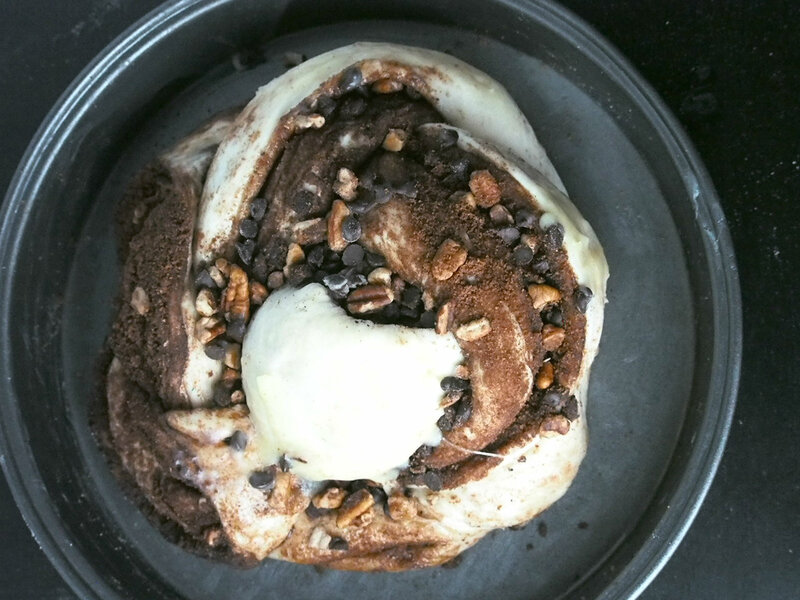 So let’s make this chocolate pecan cinnamon bread. In a small bowl, combine yeast, powdered sugar and 2 tablespoons warm milk. Let this stand until thick and foamy, about 20 minutes. Now in a large bowl, stir together the sugar and egg using a whisk . Add to this the yeast mixture, the remaining milk and 1/4 cup of the flour. Stir everything until the mixture is smooth. Let this stand for 2-3 minutes. Mix the salt with the remaining flour and add them to the mixture in the bowl. This is where you will need a wooden spoon to stir the dough that will be so sticky initially. As you stir, you might think “Oh I should have used my hands“, and of course you can. But trust me, it is better to wrestle against the sticky dough with a wooden spoon than to deal with all the mess and sticky goo if you decide to take the matter with your own bare hands. Anyway, it is just a short wrestle. You won’t sweat at all, promise. Soon, the dough will be smooth. And it is nice to have your hands clean and not sticky. Add two tablespoon of melted butter to the dough. This is such a relief, for the sticky dough will now loosen up and be easier to handle. Now this is when you can use your hands. This time, I will have to say that your hands are better than the wooden spoon. You can incorporate the butter to the dough more efficiently with your fingers than with the wooden spoon. So feel free to get your hands in there and smash the dough gently for about 5 minutes or so, until the butter has been mixed in. 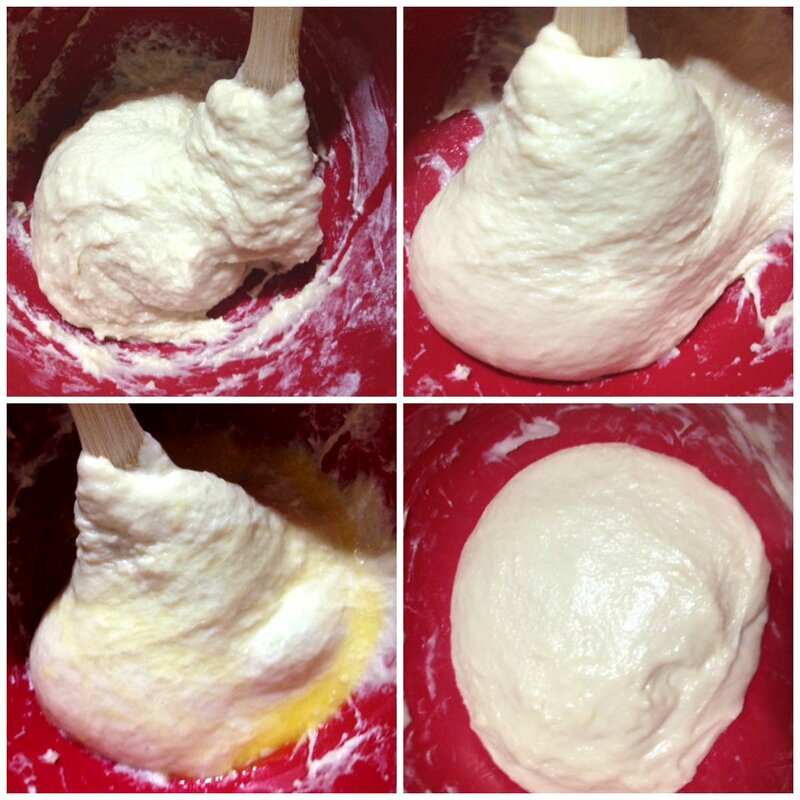 See the photo above, from left to right, the sticky, messy dough, then followed by the smoother version after the initial mixing. 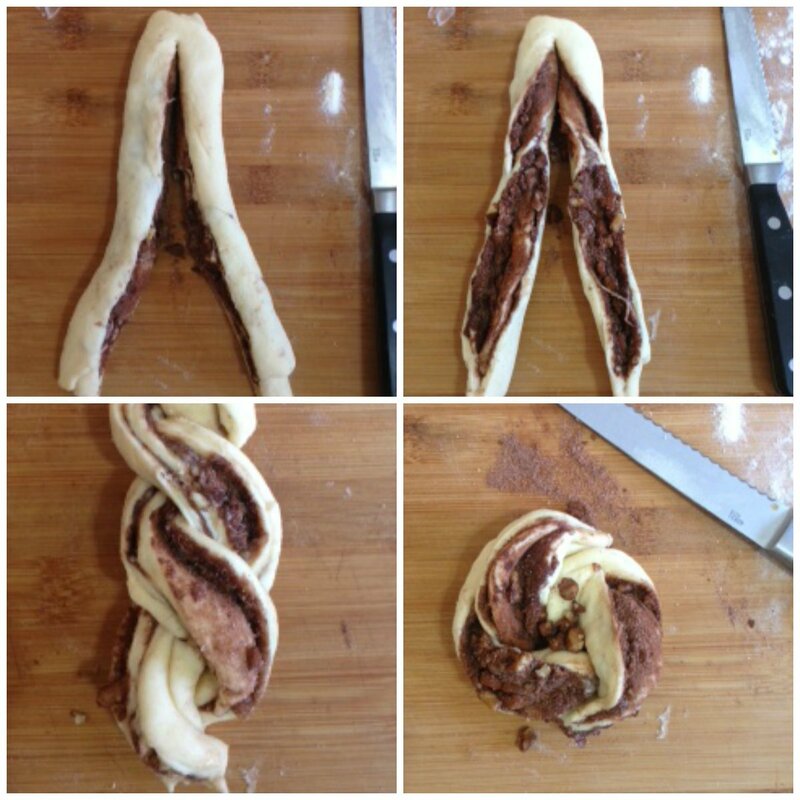 And then the addition of butter , and the final, soft and smooth dough. Let the dough rise in the bowl, covered with plastic wrap for 1 and 1/2 hours. After rising, gently knead the dough inside the bowl to deflate. Chill the dough, still in the bowl for at least one hour or up to 2 days in the fridge. After chilling, let the dough rest for about 5 minutes in the counter. In a floured surface, roll the dough to a rectangle 17 x 7 inches. 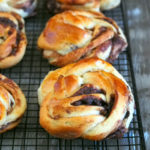 You will need to flour your hands, the surface and the rolling pin as the dough might stick to the surface and to you. Spread melted butter over the dough using a pastry brush. Reserve a couple of tablespoons of butter for greasing your pan and for brushing the surface of your assembled dough later. Sprinkle the filling over the butter and use your hands to spread them evenly across. Starting on the long side, roll the rectangle to form a tight log. Seal the edges by pinching them close. Pinch the seams together to seal. Sprinkle any nuts and chips that have fallen out on top of the dough. Place assembled cinnamon bread gently on your greased 9 inch baking pan. Brush remaining melted butter on the surface of the dough. Cover this loosely with a plastic wrap and let rise for 1 and 1/2 hours. Pre-heat oven to 350 F. Set the pan on a baking sheet and bake for 15-17 minutes. The top should be lightly golden. Your house will be warm and cozy from the wonderful smell of the cinnamon bread. Enjoy this warm and store leftover tightly wrapped at room temperature. 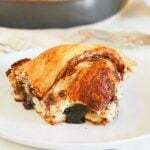 A tasty, soft cinnamon bread filled with cocoa, chocolate chips and pecan nuts. In a small bowl, combine yeast, powdered sugar and 2 tbsp. of the milk. Stir and let stand for 20 minutes until thick and foamy. In another large bowl, combine egg and sugar and stir well. Add in the yeast mixture, the remaining milk and 1/4 cup of flour. Stir to incorporate the ingredients and let this mixture stand briefly for 2-3 minutes. Combine the remaining flour and salt. Add to the rest of the ingredients in the other bowl and stir using a big wooden spoon. 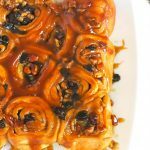 This dough will be very sticky but don't add any flour. Keep stirring for about 7 minutes, until the dough is smooth. Add 2 tbsp. of butter to the sticky dough and this time using your hands, incorporate the butter to the dough by mixing it for about 5 minutes, until the dough is very smooth and soft. Place dough in a bowl and cover with plastic wrap. Let rise for 1 and 1/2 hours. After rising, let the dough chill in the fridge for at least one hour or up to two days , covered with plastic. After chilling, knead the dough lightly in the bowl to deflate. Turn it over onto a floured surface. Roll the dough to a 17 x 7 inch rectangle. Flour your hands, your surface and your rolling pin as necessary. Grease a 9 inch round pan with some of the remaining melted butter. Then using pastry brush, brush melted butter on the surface of the dough (reserve about a tablespoon for brushing the dough later). Sprinkle the filling ingredients over the butter and use your hands to spread them evenly over the surface of the dough, leaving about half an inch borders on the sides. Roll the dough starting on a long side of the rectangle. Flour your hands so that the dough does not stick to you. Roll it into a log as tight as you can and seal the edges by pinching the seams together. Using a sharp knife, cut the log in half vertically but leave about an inch uncut at the top. Now this part can get messy as the filling might ooze out and the flaps of the log might open up. Just continue on, pinch close the logs if they open up. Turn both the logs so the cut side is up. Braid the logs together by twisting them over each other so you will form one spiraled log. As you reach the end, shape the log into a coil by twisting it in a circular manner and then tuck the ends under the coil. Brush remaining melted butter over the surface of the dough. Place assembled dough on the prepared baking pan and let rise for 1 and 1/2 hours, covered loosely with plastic wrap. Pre-heat oven to 350 F. Bake the bread for 15-17 minutes, the top should be golden. 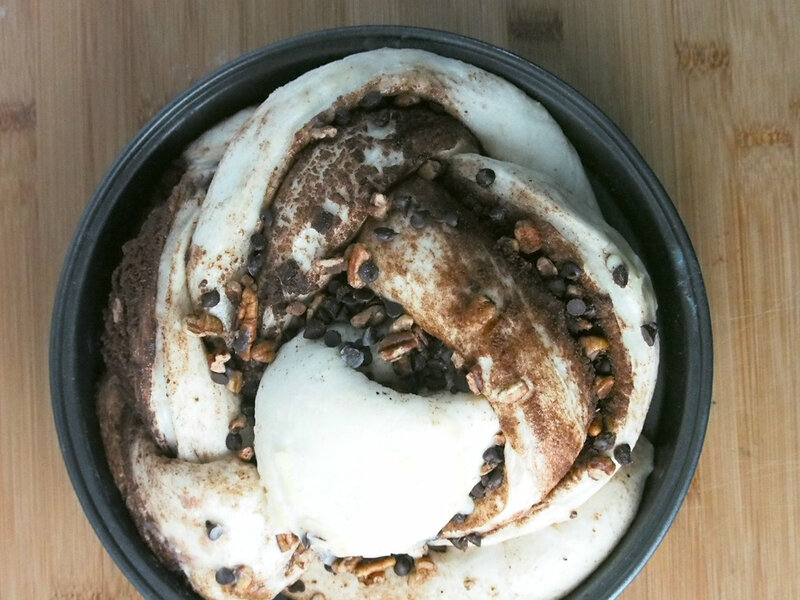 Combine sugar, cinnamon, cocoa, chocolate chips and pecan in a bowl. Stir thoroughly until incorporated. Dough recipe adapted from here.